Roy Jones Jr has called Lomachenko-Rigondeaux "the best professional fighter ever made". Ukrainian Vasyl Lomachenko is the "greatest fighter since Muhammad Ali", believes legendary promoter Bob Arum. On Saturday, Lomachenko will defend his WBO world super-featherweight title against Guillermo Rigondeaux, holder of the WBA super-bantamweight crown. The Madison Square Garden fight is the Ukrainian's 11th professional bout and the first time that two double Olympic champions have faced off. "I've never seen a fighter as technically perfect as him," said Arum. Ali's promoter in the 1960s has since worked with the likes of Roberto Duran, Floyd Mayweather and Manny Pacquiao. The 85-year-old describes working with Lomachenko as the type of "gift" which puts him off retirement. "I am telling you without any reservation that Lomachenko is the greatest fighter I have seen since Muhammad Ali," Arum told BBC Radio 5 live's boxing podcast. "For me to take a modicum of credit would not be correct. "I'm not going to have any real part of it except to get him the fights necessary so that people acclaim him when he retires as the greatest fighter of all time and mention him in the same breath as Ali, Sugar Ray Robinson and those types." Former four-weight world champion Roy Jones Jr has called Lomachenko-Rigondeaux "the best professional fight ever made". Rigondeaux, 37, is eight years older than his rival and has jumped two-weight classes to take the fight. Cuba's 2000 and 2004 Olympic champion can win Lomachenko's WBO title, a feat which would see him become a multiple-weight world champion. 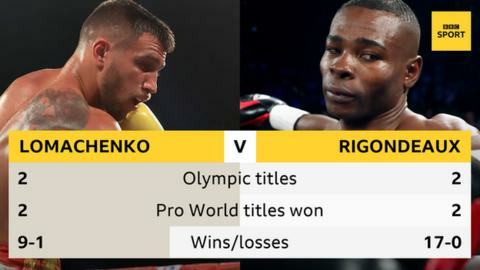 He has been vocal on social media in denying those who have written him off but the weight jump, coupled with Lomachenko's burgeoning reputation see him start as underdog with bookmakers. Lomachenko has lost once as a pro, a defeat to Orlando Salido in his second bout which was for a world title. And legendary trainer Freddie Roach believes Rigondeaux will come out on top, labelling him "one of the best defensive fighters I have ever seen". Arum admitted to BBC Sport boxing correspondent Mike Costello that the Cuban "is phenomenal" with a style which looks to "pile up points". "The reason he hasn't been marketable is because he has that Cuban style which is you win the early rounds and then you coast," said Arum. "The difference between Rigondeaux's philosophy and Lomachenko is Lomachenko is always in there looking for openings with the end result being to destroy his opponent - to look for weaknesses, knockout his opponent or make him quit." Lomachenko, 29, compiled a stunning amateur record of 396 wins and just one defeat and has broken records in winning two world titles at featherweight and super-featherweight inside his first seven pro fights. Ukraine's 2008 and 2012 Olympic champion has become known for combining accuracy, creativity and sublime movement in the ring. Arum gives all credit to Lomachenko's father - Anatoly - who has coached several of Ukraine's top Olympians and asks his son to complete mental puzzles at the end of training sessions. As an example, after a lengthy workout Lomachenko picks out numbers in sequence from grids of random digits which hang from a wall and mixes this task with stacking small blocks on a table at speed. "When Vasyl was a very young guy, his father would not allow him in the ring until he took ballet lessons," Arum explains. "Then he made him do gymnastics. Vasyl has skills that other boxers do not have. When you see Vasyl Lomachenko you see a man with unbelievable qualifications. "For example, he brings a sport psychologist to every training camp and after every training session, he goes with the psychologist and they talk about God knows what. Then the psychologist makes him do mind games. Whatever he does, I've never seen it before but it works. "He's such an unusual person. He comes over to my house every once in a while, always bearing gifts. He brought me a backgammon set where the centre is the picture of him and myself. He's thoughtful. As a promoter the gifts are normally only ever going one way." I remember watching Lomachenko back at the 2008 Olympic Games. Back then - and this is not hindsight as I said it at the time - there was something about him. He is so un-Soviet like. The fluency and creativity is there. So many fighters from there and that era have that stand-up style. He brings the teak toughness, their tournament hardness but he also has this beautiful creativity. When Lomachenko does stuff in the gym, you're not quite sure if the film has been played with, it's almost sorcery. He is one of the finest fighters that I have ever seen. Flaws and faults? People have been looking for 15 years since he was a youngster. We are settling on two defeats, one as an amateur, one as a pro.